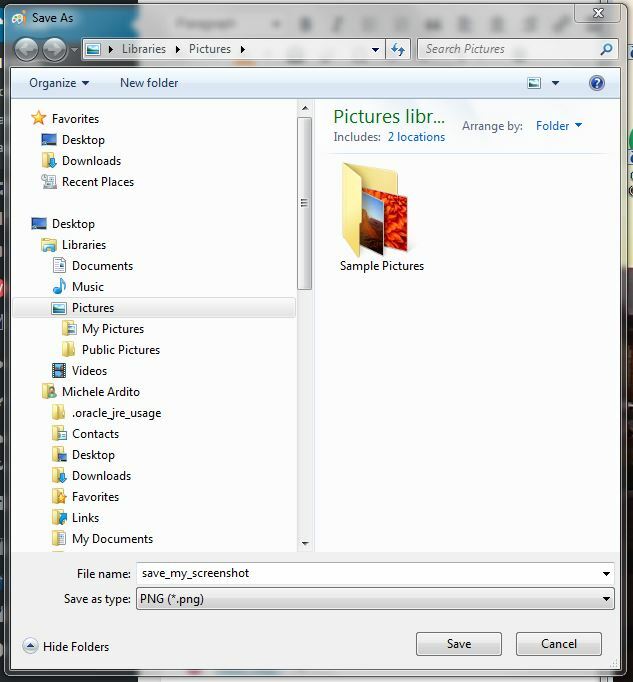 Are you looking for how to take a screenshot on Windows 7? Sure, there are a lot of reasons why you want to take a screenshot on PC. For example for an e-mail attachment. But what really is a screenshot? As the term suggests it is a shot of the screen, an image, a picture but taken directly from the source. A screenshot can be a portion of the screen or could include the entire screen. It is quite simple to take but may differ depending on what operative system we are facing. There are even different modes on the same system and different methods, for example using native tools or third-party applications. So, let’s go into the exploration of different methods on different systems. 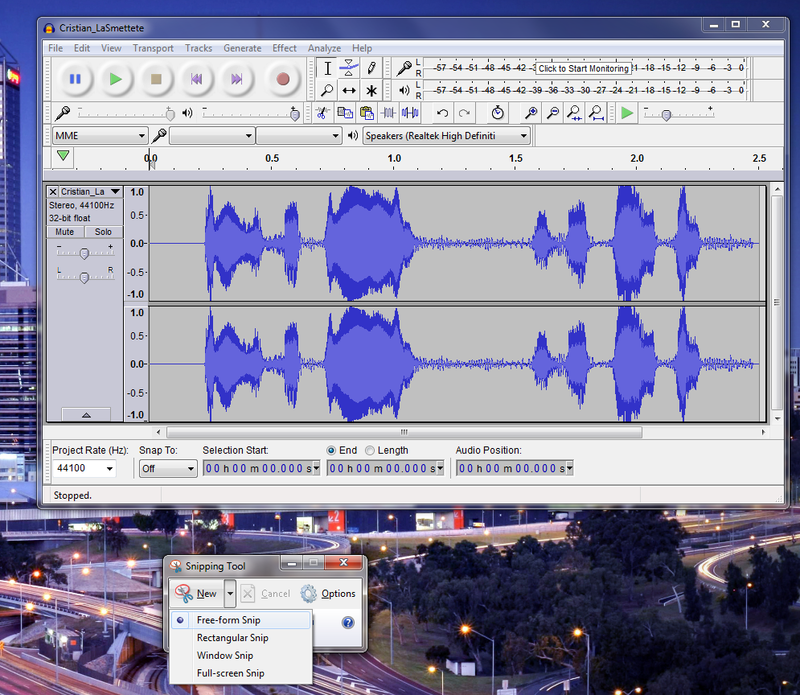 Microsoft Windows 7 (Windows Vista also) features several built-in utilities for capturing and saving screenshots. What you need are only some shortcuts and a few clicks. 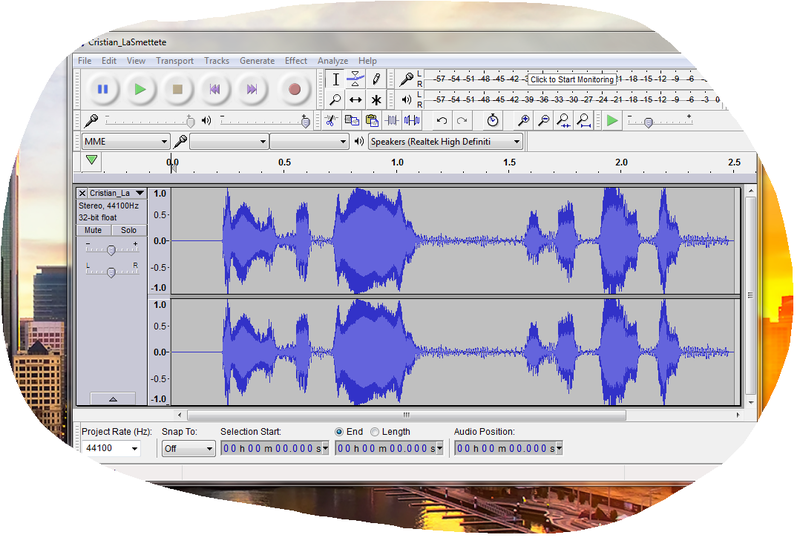 The simplest capturing method is to use some shortcuts that Windows exposes. 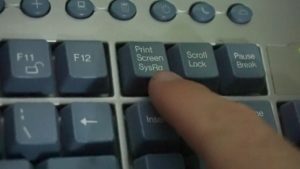 If you want to take a screenshot of the active windows only you can press a combination of the key “ALT“+”PRINT SCREEN“ on the keyboard. But seems that nothing happens! It isn’t correct. 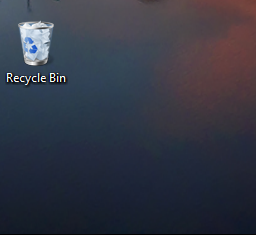 After we press one of the combinations above, Windows captured the screen or the active windows and copy the equivalent picture directly into its own clipboard. 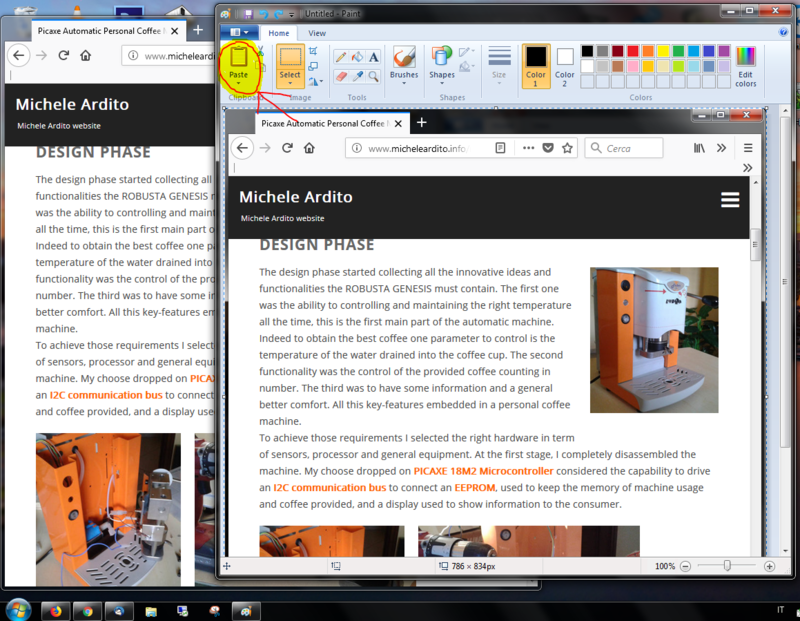 Now what we need to do is paste the image into our application simply using “CTRL“+”V“ keyboard shortcut combination. In this way, we could save the screenshot image as a file for further use or we can immediately attach to an email or open in a photo editor software for elaboration. Let’s do it! We need to capture a screenshot from a website so the first thing to do is open the web-browser and point it to the website we need. In my case, I opened my Mozilla Firefox and write www.micheleardito.info as a website address. 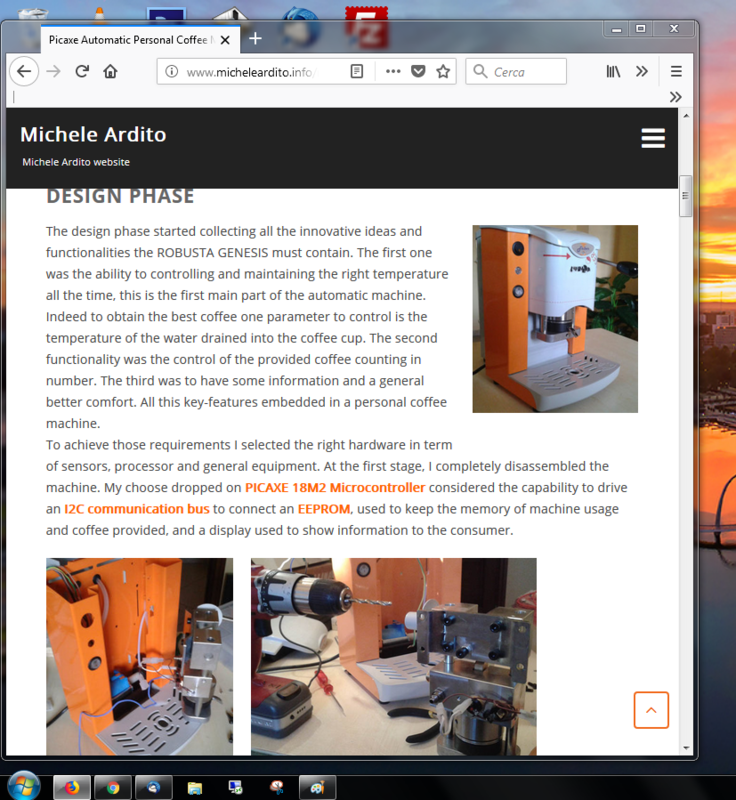 I searched the page I would like to take a screenshot and following as I described just before I pressed the magic shortcut combination “ALT“+”PRINT SCREEN“ – the screenshot is taken and copied into the system clipboard. After that, I opened Paint. 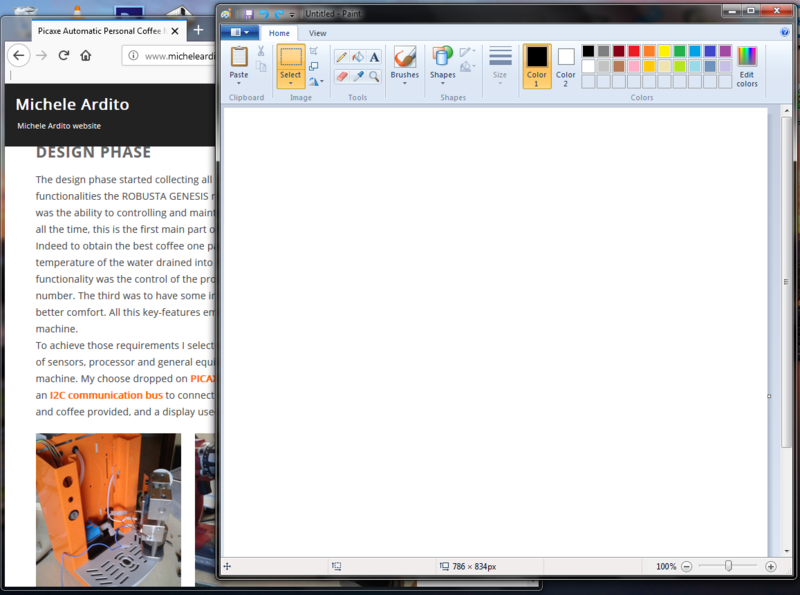 And finally, I used the “Paste” button on the top command bar of the Paint program. Alternatively could be used the “CTRL“+”V” keyboard shortcut. Paint automatically set the image size accordingly with the screenshot we take. If we need to take a screenshot of the whole screen we need to use the simple key “PRINT SCREEN” without any combination. And again we can paste the screenshot captured into Paint. Now the image can be saved as a file. We need to click on the blue ribbon upped side of the paint to activate the menu. From the drop-down list, we must select the Save button and click. 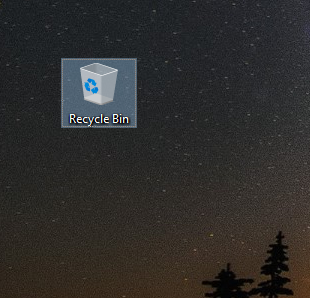 Now, we need to select the image format type (JPG or PNG) and locate a folder where we would to save our screenshot and press the button “Save“. 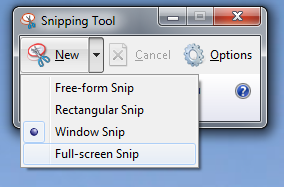 Snipping tool is installed with Windows 7 and so it’s available at any moment as part of the system. This tool offers you much freedom. You can select different screenshot capturing options. The last two ones are similar to the methods explained in Method 1 approach but are obtained inside the tool. So let’s try to view one by one. Selecting the Free-form Snip will take us the possibility to draw a freehand portion of the screen. After we activated the selection by New -> Free-form Snip, the whole screen became white light opaque. To accomplish this we need to move around the screen with the mouse reaching the area of the starting point of our screen capture. Left-click and moving around without release the click. We need to describe an area as possible closed form and when we close the form we can release the click and let Snipping Tool capture the area we selected. 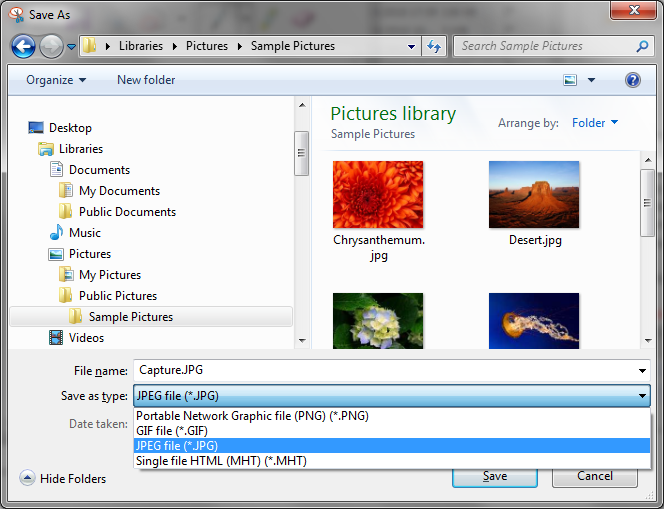 A dialogue windows box let us choose the file destination, the name and the image type. 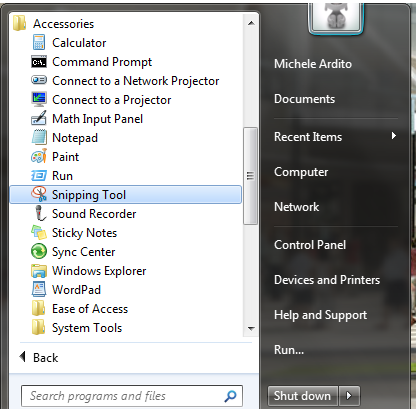 But the Snipping Tool has a trick: when it captures a screenshot it copies automatically into the Windows 7 clipboard. So if you open an image editing program and use “CTRL”+”V” or “Paste” command the image appears into the editor windows. … and the magic takes place! 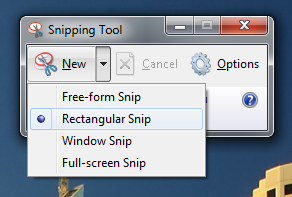 The second option that Snipping Tool gives us to take a screenshot on Windows 7 is the Rectangular Snip. As Free-form Snip, this option let us select the screen region to capture but with a rectangular selector instead of the free form. The selection happens in the same way: we need to select New -> Rectangular Snip. The screen appears to us with a white light overlay enabling us to capture the area. So by the mouse, we need to point the starting selection point, click on the mouse left-button and drag the selection to the endpoint. When we release the mouse button the selected screen region will get into the windows tool. As the previous selection method, we can save or paste into another program. The third and fourth methods let us select a window to be captured or capture the entire screen. 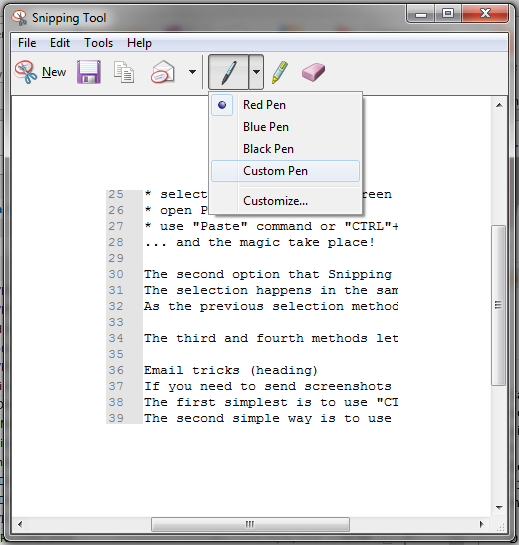 Into the Snipping Tool, we can use a very basic drawing tool like a pen or marker. After the screenshot was taken we can select a pen tool from the upper main bar and in a freehand mode, we can draw anything we need, freely. In the same way, we can use a marker to draw on words or on part of the image a yellow ribbon mark. After that, we could save or past the picture obtained as described above. If you need to send screenshots by email there are a couple of tricks. 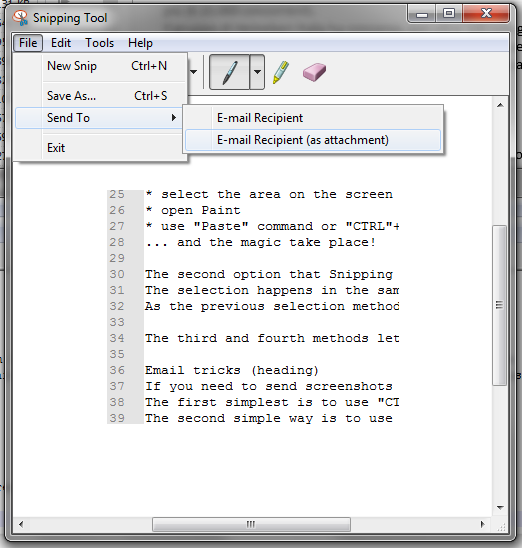 The first simplest is to use “CTRL”+”V” or “Paste” function directly into the email client just after you take a screenshot using Method 1 or Method 2 explained before. 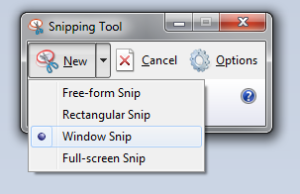 The second simple way is to use a feature included in the Snipping Tool. After the capture takes place we could use File -> Send to -> E-Mail Recipient or E-Mail Recipient (as attachment) or we can use the letter symbol in the top main bar of the tool. The email client installed starts-up and the image became an attachment directly let us write destination addresses and text.